How do you resurrect a citizen initiative that failed three years prior? In 2018, Effct led digital media for the YES on 300 campaign. 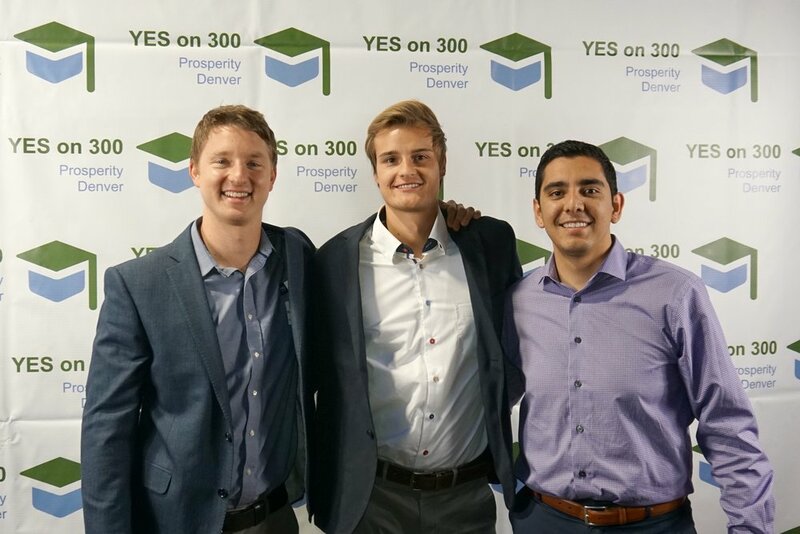 Initiative 300 is a .08% sales tax increase to generate $14 million per year for scholarships for Denver students to achieve their dream of higher education through college, community college or trade school. Previously, under different digital leadership, a similar initiative failed in 2015 with 52% of the Denver electorate voting NO. But, with a revived campaign in 2018, and under Effct’s digital direction, the campaign succeeded with 52% of the Denver electorate voting YES. Here are the drivers of success we brought to the campaign to help ensure victory. YES on 300 was a lean campaign that utilized almost entirely digital and T.V. as its only campaign outreach components. Effct brought a nuanced strategy to digital, choosing to target all of the major social media platforms -- Facebook, Instagram and Twitter -- as well as Google products including AdWords and YouTube (organic and pre-roll). Instead of blasting a standardized message, Effct carefully targeted voters with specific messages based on demographic factors such as their zip code and interests. For example, we appealed to working class voters with content around the initiative’s prioritization of trade and technical school training. Meanwhile, we targeted wealthy voters with messaging from the Denver Chamber of Commerce emphasizing the economic benefits the initiative would bring to the city. Our outreach campaign combined quality and quantity. Click on the social icons below to explore our channels. To get people talking about the initiative, we decided to use nostalgia. We created the #YESon300 Challenge, which encouraged our followers to post a photo of themselves from college, and explain why higher education is important. We reached out to influencers such as elected officials. From there we encouraged our general audience to post. The result was a great influencer marketing campaign as well as a host of user generated content that spread the word about the initiative. Effct wanted to show the people whose lives have been improved by college scholarships. So, we partnered with local nonprofits such as the Denver Scholarship Foundation and Puksta Foundation, to tell the stories of scholars whose lives had been dramatically improved by a college scholarship. We then used our paid digital marketing strategy to make sure these videos reached voters in Denver who leaned liberal or centrist. Our campaign management team did an outstanding job of rallying high-profile elected officials to advocate for YES on 300. Effct’s job was to amplify their voices. So, we turned our television commercial into a digital ad, and broadcast it on YouTube, Facebook and other social media channels. We also turned videos of elected officials such as Governor John Hickenlooper and Mayor Michael Hancock speaking at events, into short digital spots. We targeted the videos at individuals who supported those elected officials. In addition, we repurposed video from the Denver Chamber of Commerce and CEO Kelly Brough into a short digital spot, and targeted it at middle income and wealthy voters. In addition, we galvanized individuals through traditional media. That included working with former mayors Wellington Webb and Federico Peña to produce an op-ed that ran in The Denver Post. While we did not receive the endorsement of the Post (no Denver initiatives did in 2018), we did publish this op-ed, and run it as a paid advertisement with custom graphics on Facebook. In a high profile campaign such as YES on 300, where people are divided on the issue, it’s critical to have a team dedicated to monitoring the discourse. When we posted videos from elected officials, people chimed in their comments, sometimes genuinely interested in learning more. Other times they were simply looking to start trouble. So, we responded to those who were interested or who had genuine critiques. And we removed the comments of troublemakers, and banned those individuals from the page. Our ground-level engagement also included speaking at registered neighborhood organization meetings. The outstanding campaign team made sure we had contact with influencers in our local communities, and Effct was glad to speak at a handful of these gatherings. The YES on 300 campaign was an outstanding victory for Effct, and one that taught us and our client the power of digital media. We combined a grass-tops and grassroots campaign with engaging content and strategic targeting to win by about 10,000 votes. This campaign was only victorious through a top-notch digital strategy and Effct is proud to have served as digital consultant. Now, students in Denver who work hard, but can’t afford college are able to tap into a large pool of funds that will help them achieve their dream of higher education.